Like most of the US, we’ve been in the midst of the “polar vortex” here in NY these past few weeks. We’ve been advised to stay inside most days with dangerous cold temperatures struggling to get out of the single digits. School has even closed a few days because of it! We’ve been making the best of our time inside by doing craft projects, playing games on the iPad, watching movies, and enjoying comfort foods. 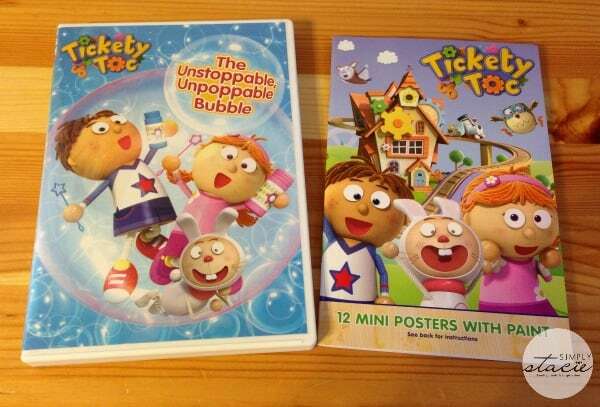 Arriving just in time to add to our inside fun, we received the latest Tickety Toc DVD release from Anchor Bay Entertainment – “The Unstoppable, Unpoppable Bubble”. In addition to the DVD, we received a coupon for a free product from Cedar’s Mediterranean Foods and some spending money to pick up some snacks to munch on while we watched the DVD. Being a fan of Cedar’s hommus products, I was excited to try something new for our little DVD screening party. 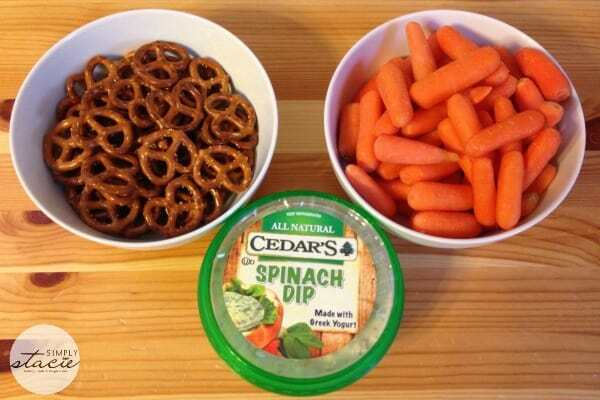 I choose their spinach dip, made with Greek yogurt, and some pretzels and carrots for dipping. We settled in front of the TV one cold afternoon with our snacks and our DVD, ready for some Tickety Toc fun! My boys love the Tickety Toc show that airs on Nick Jr. courtesy of Zodiak Rights, and we all sat on the couch enjoying the episodes on the DVD and eating our snacks. It was nice to be able to combine a nice wholesome show with some healthy snacks. Made for a fun afternoon. The DVD features six full length episodes with the lead episode featuring the main characters Tommy and Tallulah in some bubble-trouble when the bubble formula they are testing goes out of control! Tommy and Tallulah and the rest of the gang have to work together to get themselves out of the bubble before chime time. This episode, as well as the others, teaches the importance of teamwork, community and social responsibility. It’s a DVD you can be proud to share with your preschoolers. And to add to the fun, this DVD comes with a 12-mini-poster painting book that’s perfect for rainy/snowy day fun! You can feel good about snacking on Cedar’s products while you watch – their all natural dips, wraps, pita chips, salads, and snack packs offer a healthy way to snack for kids and adults alike. 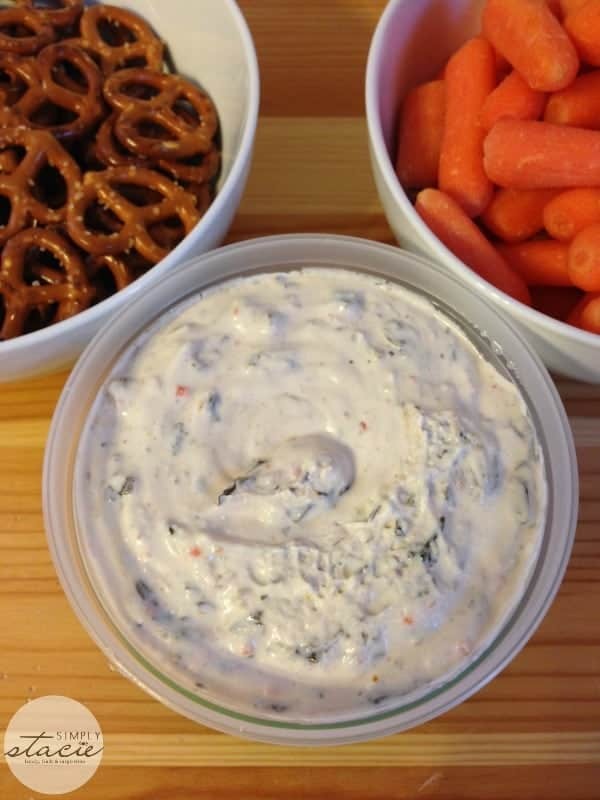 We all enjoyed the spinach dip – it’s creamy and tasty and my kids loved dipping their snacks in it! While in your local grocery store be sure to look for specially marked packages of Cedar’s products that offer a $2 discount on purchase of the Tickety Toc DVD. The Tickety Toc DVD was just released on January 7th from Anchor Bay Entertainment, runs 68 minutes and has an MSRP of $14.98. You can learn more about Anchor Bay and the Tickety Toc DVD on their site. This looks so cute! I bet my kiddos would like it!